This blog post was co-authored with Brad Glosserman, executive director of Honolulu-based Pacific Forum CSIS. A version of this post also appeared as a Pacific Forum CSIS PacNet publication, and can be found here. The announcement that China has cooperated with South Korea to open a memorial hall in Harbin in honor of Ahn Jung-geun, the independence activist who in 1909 assassinated Hirobumi Ito, Japanese colonial governor of Korea (then a Japanese protectorate), symbolizes the historical obstacles to forward-looking Japan-South Korea relations. The ensuing controversy reflects divergent views of history – one man’s terrorist is another’s “freedom fighter” – but this incident also illuminates a deeper, and more compelling, dimension of the split between Japan and the ROK as it is currently framed: contradictory conceptions of national identity that stand in the way of reconciliation steps necessary to improve relations. The contrasting views of Ahn illustrate the divide. For South Koreans, he is a “national hero,” the man who struck at the embodiment of a hated imperial power that had subjugated Korea and sacrificed his life for national independence. To Japanese, he is a criminal, the man who killed a seminal figure in their nation’s history, a leading light in the modernization of Japan, a four-time prime minister who promoted Japan’s national interest and ensured its survival in a hostile world. Those images go beyond contention over historical “facts”: they reflect foundational views tied to national identities and cannot be easily overcome without doing damage to each nation’s conception of its self. The causes of tension in Japan-ROK relations are well-known: territorial disputes, divergent interpretations of history, fractious domestic politics. Perhaps even more important, but much less discussed, are Japanese and South Korean notions of national identity. The conceptual building blocks in each society encourage divergent Japanese and South Korean perspectives of their respective situations and push the two countries toward conflict. 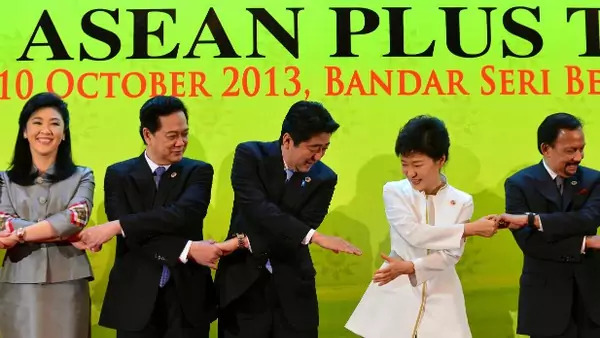 Political solutions to the problems of Japan-South Korea relations will continue to fail as long as each country’s current identity – the sense of who it is and what it stands for – is framed against the other. As long as the current narrative remains built around opposing national identity concepts, divisions will run deep. Despite South Korea’s remarkable modernization and democratization over the past six decades, four decades of Japanese colonial rule that it was forced to endure remain central in Korea’s conception of itself. As a result of having been subjugated to Japanese rule, South Korean identity has long been measured against and framed in opposition to Japan. Japan has its own victim complex, the product of defeat in World War II, the atomic bombing, and a sense of being discriminated against in the postwar accounting of misdeeds. This identification complicates Japan’s concept of its identity, making it difficult for Japan to perceive itself as an aggressor. In addition, the decision 150 years ago to “go out of Asia” puts Japan on the other side of the historical and cultural fence and reinforces the distinction between the two countries. Cumulatively, these narratives drive politics, reinforce one’s own preferred interpretations of history and harden territorial disputes. Paradoxically, the many similarities between the two countries reinforce their differences. They sharpen competition and deepen distinctions between them. That is why the main missing ingredient necessary to achieve the task of healing the divisions between South Korea and Japan is statesmanship, in which both nation’s political leaders resist the temptation to succumb to popular and already established national identity tropes that protect their approval ratings and aid domestic politicking. Statesmanship will require leaders to address the past not simply as a legal issue between the two governments, but in a way that also addresses the lingering hurt of colonization at a personal and political level. Ultimately, South Korea will have to determine precisely what actions it will accept from Japan as expressions of remorse that would then enable the two countries to move their relations forward. Japan will need the courage to meet those requirements sufficiently. If leaders from both nations can generate the political will among their respective publics to reframe the relationship, the realization of a solidified Japan-South Korea partnership would be mutually beneficial to both nations. A Joint Declaration is needed to establish the foundation for a renewed Japan-South Korea relationship; it would acknowledge and stop contesting historical hurts, affirm common democratic values, and pledge solidarity to maintain a peaceful neighborhood and respond jointly to new security threats. Such an understanding would help transform perceptions within each country and blunt the sharp edges of identity that drive the two nations into conflict. First, it should contain a “no-war” statement that would assert that the two countries would never use force to settle any dispute between them. This would put a cap on tensions and deflate suspicions that frictions might be resolved by force. Second, Japan should declare its support for the unification of the Korean Peninsula under the Seoul government, a statement that would end speculation about long-term intentions in Tokyo about the fate of the Peninsula. Third, it would delineate the shared values and interests that unite the two countries, including maritime security threats and bilateral trade issues. The agreement would also declare these commonalities as a basis for cooperative action by the two governments. Fourth, it would establish a day for the two countries to jointly commemorate the history of the 20th century without being entrapped by it. The current August 15th commemorations memorializing Japan’s defeat and South Korea’s liberation from imperialist aggression should be replaced with an event that can allow both nations to be involved in the ongoing history-remembering process as equals. A forthright effort to sensitively address the issues of the past might be one of the most important steps these two countries can take toward securing their common interests in the future.